TFQ: HOW did you come up with this story? PAOLO: Nightworld was created a dozen years ago for a very specific purpose: to take me out of anonymity, I tried to think of the much commercial comic book I could conceive. The blend of gothic horror and superheroes was very on-trend in those days but has been demonstrated to hold well today too, since with the help of Adam this book sees the light! ADAM: When I first saw Paolo’s pages I was enchanted -- in a good and evil way :-). I sensed this could grow into the kind of pop lore that would establish Paolo’s talent in the U.S the way it deserves to be, and our creative process became telepathic…or maybe he just cast a spell! TFQ: You started a kickstarter fund for this comic. Was this your first experience with Kickstarter? How was that process? ADAM: It was my first experience, and a satisfying but exhausting one. I didn’t realize that begging was a full-time job :-), but you really do have to call on all your contacts and any communities that might be interested -- in this case, horror fans, admirers of the Kirby legacy, etc. Kickstarter is great for pre-testing what kind of audience is out there, and our cult certainly came together to put us over the line. TFQ: So many people describe this comic as Kirby-tastic but besides the linework, the character designs reminded me so much more closely of Mignola (accepting of course Kirby's wide range of influence). How do you feel about all this feedback? PAOLO: The artwork has been described also as a mix of Kirby and Charles Burns or as Mike Allred under the influence of hallucinogens! I hope it does not come out as something too bizarre for a wide audience. Mignola is one of my favorites of the Modern Age artists, it may not be so direct an influence on Nightworld but both Mignola and I are fans of classic horror movies so this may explain some affinity in the characters’ design. I'm not interested in cloning Kirby (it would not be possible anyway! ); the first story was done 9 years ago, in the time since I have minimized the use of crackle, squiggle and muscles done with slashed lines. My influence is a blend of Golden and Silver Age (Ditko, Colan, Romita Sr., Everett, Crandall, Maneely). I sure think that the classic style of comics is something to defend but I'm not a revivalist, I try to use it to make stories that fit the modern age and serve as a starting point for future evolution; in fact I came up with the slogan “pure comics for now people”! TFQ: What were the major influences behind this story? PAOLO: Both The Demon and Satan’s Six by Kirby, Hellboy, and Universal horrors of the 1930s. ADAM: The inspirations I myself drew from were Mexican vampire movies of the 1950s and ’60s, and the undersea nature-documentaries of Jacques Cousteau from the 1970s. I would see both on TV as a kid and the monster movies featured a moody, dignified vampire named Nostradamus and often had luchas fighting monsters. Nightworld’s hero Plenilunio looks like a merge of the vampire-lord and the lucha-hero, along with kabuki -- Paolo’s creativity comes from multiple sources that only a genius like him would relate to each other. But the melancholy of those period-piece vampire flicks, and the poetry of Cousteau’s continual voiceover on scenes of the alien world of the sea, were what I mainly had in mind when the “voice” of this comic came to me. Plus a century of pop-culture, occult beliefs and even news on real-life wars and fashion trends (which you’ll see some of in Issue #2), shredded and pasted back together in this surreal saga. TFQ: How did you come to release through Image Comics? ADAM: I had interviewed Erik Larsen for the Jack Kirby Collector magazine, and was joking with a friend about how Erik told me he planned to bring the undeveloped characters Kirby created to Image as new comics -- including my all-time fav Kirby character name (for a kind of sasquatch), “Thunderfoot, Last of the half-Humans!” :-) -- my friend and I were reflecting on this with admiration at a New York Comic Con in the mid-2000s and then Erik, whom I’d never seen at that con, walked passed us as if summoned. 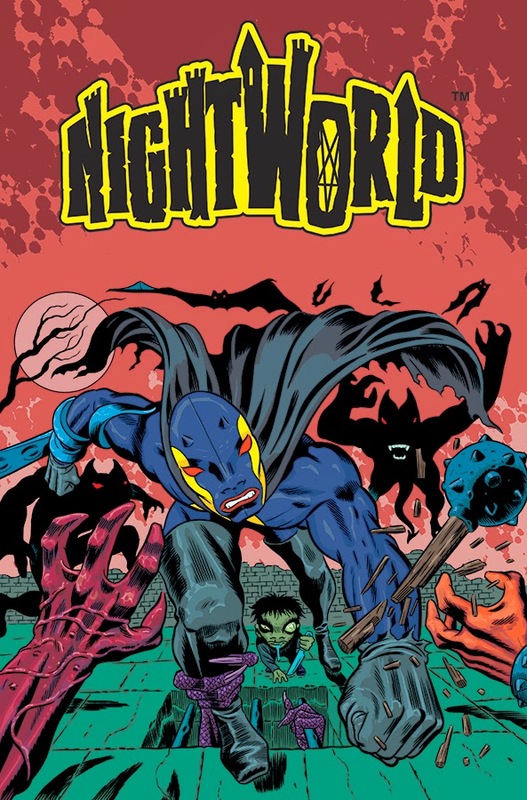 So I showed him an early proof of Nightworld #1, and he asked if Paolo and I would like to do a story for The Next Issue Project, his series of retro comic anthologies. We did an “Alias the Spider” story that appeared in “Crack Comics #63,” then two years later we had a chance to work on one of the Kirbyverse characters ourselves. That didn’t work out due to licensing issues, but Erik was all the more eager to make new legends, so he looked again at Nightworld and championed us while we finished the other three issues of the first miniseries. A few more years later and Nightworld is ready -- a fable about characters who are capable of great evil or good to choose between, but a lesson to us ordinary fans and creatives to never give up on what’s possible!